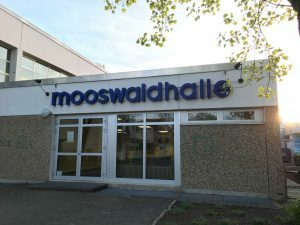 Our sports hall is called the Mooswaldhalle, Hochdorfer Straße 16b in 79108 Freiburg-Hochdorf. There are a few established carpooling opportunities from different areas of Freiburg. For more information, contact us or ask at one of our practices. Take the Breisgau S-Bahn from the Freiburg main station (or, in the other direction, from any of the stops along the way to Kaiserstuhl) and get off at Hugstetten, where you can transfer to bus line 25 to the stop Hochdorf Vorstadt (17 mins from Freiburg main station). Take the tram line 1 in the direction of Landwasser to the final stop, Moosweiher. Here, you can transfer to the bus line 36 to the stop Hochdorf Vorstadt (27 mins from Freiburg main station). Starting from IKEA Freiburg near the Freiburg Messe/fairgrounds, take Markwaldstraße in the direction of the Hochdorf industrial area (Industriegebiet Hochdorf). At the first traffic circle, go right onto Bebelstraße and then through the industrial area for about 150 meters, then turn left as the industrial area ends onto Mooswaldstraße, where you will go through a tunnel leading under the highway. Follow this road to Hochdorferstraße, then turn left and you will find the Mooswaldhalle (our sports hall) on the right after about 500 meters. There is a large parking lot available right in front of the hall. Especially from the direction of Freiburg there are car pools for our players. For more information please contact us or ask directly during the training.